GoDaddy is one of the most trusted, respected and widely recognised names on the internet. Making its name as an outstanding domain name seller and hosting provider, GoDaddy has turned its hand toward website building and is sweeping up in that market too. Suitable for beginners and veterans alike, GoDaddy’s website builder software is easy to use and powerful to boot. Building a website has never been easier. To give you the best possible start, GoDaddy have designed and published more than 800 bespoke templates to form the basis if your site. Using one of these backdrops in the website builder, you can then customize the template to give your website a personal touch and make it completely unique. You can integrate imagery and audio into your website to give it some personality – you can choose from more than 20,000 images from the GoDaddy gallery. Widgets that can be embedded in the site range from Twitter and Facebook to Paypal and shopping cart software – giving you a fully functioning eCommerce website. From blogs to online shops, GoDaddy’s website builder can do anything. Just because the website builder is so cheap and easy, doesn’t mean that it’s not the real deal. You’ll still be able to enjoy a 99.99% uptime guarantee with any website through GoDaddy, meaning your website will almost never go offline. In fact we’re talking about just a few hours in a year. This is important when you’re driving people to your website and you need it to perform – and driving those people there is easy with loads of free advertising credits. The additional features keep coming too, with easy RSS feeds, animations, slideshows and more. 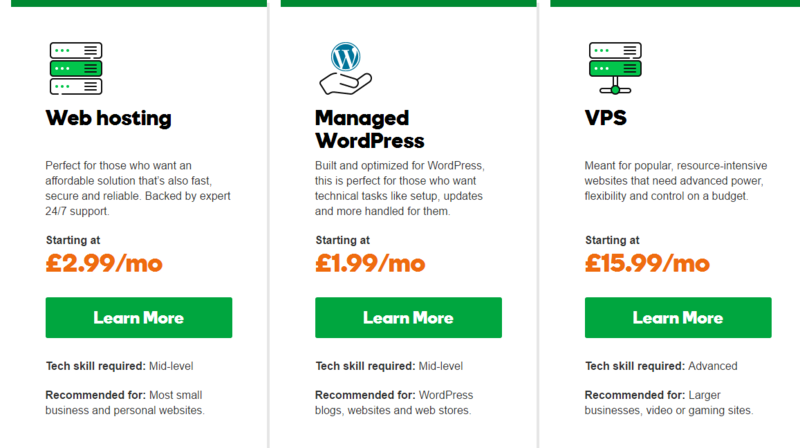 There are no real pricing concerns with GoDaddy’s website builder, more pricing surprises. For such a capable and efficient service, you’ll be pleased to hear that prices start as low and £6.99 per month and don’t eclipse £6.49. Every plan includes free hosting from GoDaddy, along with e-mail accounts for your website. You will also be afforded a generous amount of disk space, website pages and bandwidth. Don’t worry about buying a plan that you think you might grow out of, upgrading can be done in minutes – so get the most applicable plan at this point in time. GoDaddy is famous for being a transparent and supportive company – and this reputation extends into their website builder too. The FAQ questions are fully indexed and can be searched quite easily – whilst the forums provide an extra step of community knowledge and interactive support. For full assistance, you can grab the support team directly through phone or e-mail.